I felt kind of guilty about talking about the mint fudge and not sharing the recipe. So, to make up for it, I’m going to tell you how to make “Hot Spicy Toasted Nuts,” a recipe that was originally on the Better Homes and Gardens website but is now gone. The cayenne pepper gives these nuts an unexpected kick so I generally warn people before offering them some. Preheat oven to 350. Place nuts on a jelly roll pan. (I cover it with foil or parchment paper.) Toast for approximately 20 minutes stirring occasionally. Mix remaining ingredients with a whisk or fork. 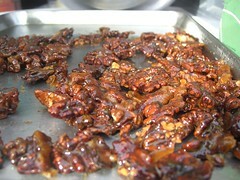 Remove nuts from oven and drizzle mixture over them. Toss until well-coated. Spread in a single layer. Cool on pan on wire rack. Store at room temperature in tightly sealed container. Makes 2 cups. 1/4 cup has 210 calories, 4 g. protein, 9 g. carboyhydrates, 19 g. fat, 0 mg. cholesterol, and 80 mg. sodium. This entry was posted in Uncategorized and tagged Cayenne pepper, Christmas, Christmas note, Christmas notes, Pecan, recipe, Spicy Nuts. Bookmark the permalink.